Winco LDT-1 Stainless Steel 2-Piece Ladle 1 oz. TigerChef > Smallwares > Kitchen Utensils > Cooking and Serving Ladles >< Stainless Steel Ladles > Winco LDT-1 Stainless Steel 2-Piece Ladle 1 oz. $0.65 Winco LDI-0 Stainless Steel 1-Piece Ladle 1/2 oz. $2.16 Winco LDI-12 Stainless Steel 1-Piece Ladle 12 oz. $1.55 Winco LDI-6 Stainless Steel 1-Piece Ladle 6 oz. $1.24 Winco LDI-4 Stainless Steel 1-Piece Ladle 4 oz. $0.86 Winco LDI-2 Stainless Steel 1-Piece Ladle 2 oz. $1.17 Winco LDI-3 Stainless Steel 1-Piece Ladle 3 oz. $0.70 Winco LDI-1 Stainless Steel 1-Piece Ladle 1 oz. $1.73 Winco LDI-8 Stainless Steel 1-Piece Ladle 8 oz. $1.51 Winco LDI-5 Stainless Steel 1-Piece Ladle 5 oz. $1.99 Winco LDT-12 Stainless Steel 2-Piece Ladle 12 oz. $0.69 Winco LDS-0 Stainless Steel Short Handle 2-Piece Ladle 1/2 oz. $2.29 Winco LDT-16 Stainless Steel 2-Piece Ladle 16 oz. $8.91 Vollrath 4970610 Jacob&apos;s Pride Short Stainless Steel Ladle 6 oz. $5.54 Vollrath 46822 Stainless Steel Ladle 12 oz. $2.03 Karware 1104105 Stainless Steel Ladle 1/2 oz. Primarily used for serving sauce or gravy, the Winco LDT-1 Stainless Steel 2-Piece Ladle 1 oz. is also great for drizzling salad dressings or portioning batter. 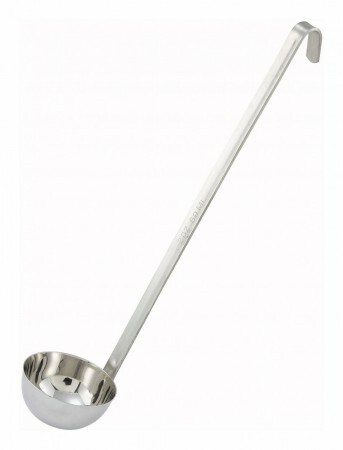 This ladle is designed with a portion-control bowl which facilitates uniform, no-spill serving. Crafted from two-piece stainless steel, this rust-resistant ladle is easy to clean and will endure heavy duty use. For added convenience, this ladle is built with a long handle for touch-free service and a hanging hook so you can easily hang it on a rack when not in use. 1/2 oz. - 1 oz.